This building's stones are textured in a way that almost resembles the surface of a natural sea sponge, giving much visual interest to this entryway. 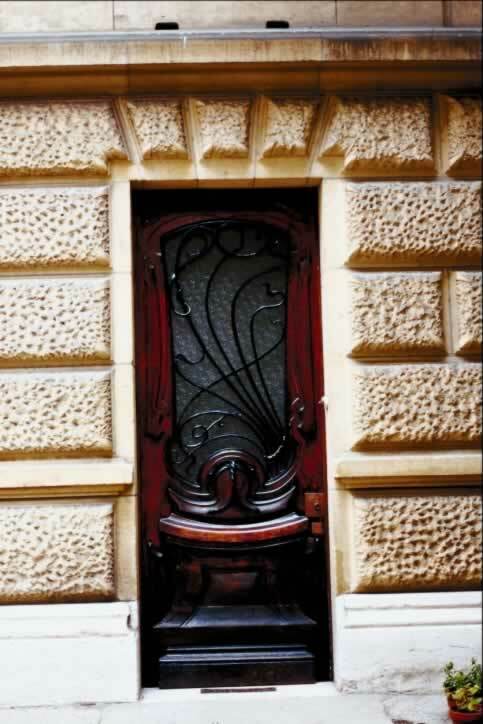 The door, though certainly not original to the structure because of its contemporary design, provides an elegant and fancy element that is otherwise missing. This single, exterior mahogany door is a framed door with two panels. The top panel is a lite--the name given for a door panel with glass--and has a square arch at the top and a reversed square arch at the bottom, instead of the standard rectangular panel. The glass is textured glass, which not only gives privacy while allowing light to enter the residence, but it also visually ties the textured finish of the stone to the door. The lite is protected by a very contemporary scrolled grille. The antique brass door knob is barely noticeable against the grain of the mahogany.